Egypt marked the fifth anniversary of the uprising that toppled longtime autocrat Hosni Mubarak, with activists taking to social media — but not the streets — to express frustration that their demands for freedom and democracy had not been realized. Since 2011, when Mubarak fell after nearly three decades in power, Egypt has seen much upheaval: the rise of President Mohammed Morsi and his once-banned Muslim Brotherhood; the ouster of Morsi by el-Sissi, a former general; and el-Sissi's launch of one of the harshest crackdowns in years, with the jailing of thousands of Islamists and scores of liberal, pro-democracy activists. Associated Press Cairo-based photo editor and photographer Nariman El-Mofty recently documented Egyptians as they reflected on the Arab Spring uprising. Ahmed El-Sheikh, a 25-year old Egyptian freelance investigative journalist, poses for a photograph inside his home, during the fifth anniversary of the 2011 uprising, in Cairo, Egypt, Monday, Jan. 25, 2016. "Why don't we go down today? Because if we do we will either be arrested, tortured, or killed by the law. The political figures who owe their fame to activists have deserted us. The media does not support us at all," he says. El-Sheikh lost his eye on Jan. 28, 2011 from a pellet during clashes in Alexandria. Ghalia Ibrahim, a 37-year old dentist and triathlete, poses for a photograph inside her home, during the fifth anniversary of the 2011 uprising, in Cairo, Egypt, Monday, Jan. 25, 2016. "I went on my bicycle to Tahrir Square and told the pro-regime people celebrating there that President Abdel-Fattah El-Sissi came to power because of the Jan. 25 revolution. I am very positive and hopeful that the country has a bright future. The people have to start working and stop criticizing," says Ibrahim. 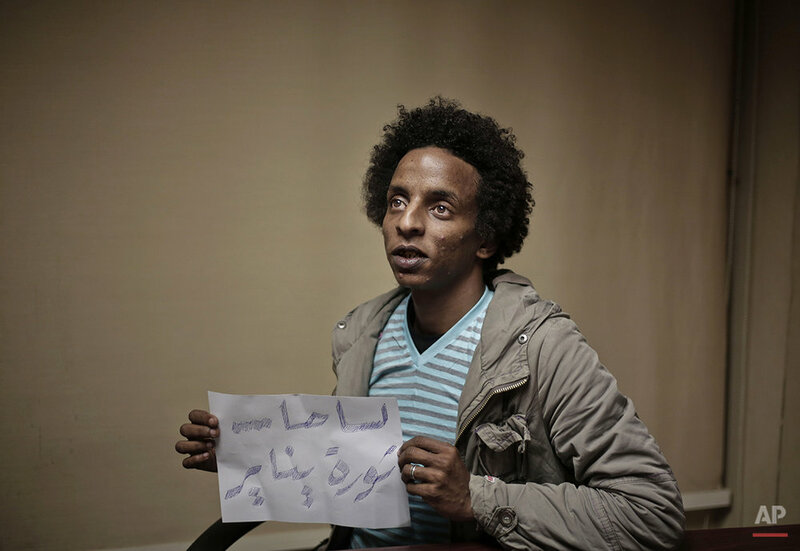 Hesham Abdel Hamid, a 25 year-old Egyptian photojournalist, poses for a photograph with a paper that reads, "it is still the January revolution," in his office, during the fifth anniversary of the 2011 uprising, in Cairo, Egypt, Monday, Jan. 25, 2016. "The 2011 uprising is special to my heart because this is when I met the love of my life. After five years the situation is much worse. Our voices are hidden. It is really difficult when you have principles and are requested to stand against them every day. The revolution was not supposed to be about one person, it was about uniting people behind an idea towards a higher purpose, and I do not see this happening at all," he says. Abdel Hamid went to Tahrir Square to hold up this sign but was not able to do it. A 27-year old Egyptian artist stops with her bicycle in front of the Kasr Al Nile bridge that leads to Tahrir Square, after making her way back from the square, during the fifth anniversary of the 2011 uprising, in Cairo, Egypt, Monday, Jan. 25, 2016. "The anniversary of Jan. 25 2011 does not represent a single moment, but the start of an ongoing movement. This affected everything from the big things to the little things – such as giving me the push that I needed to ride my bike as a woman in Egypt. We have a different understanding now of public spaces and of our streets and that cannot be undone – no matter how hard they try," says the young artist. Abdullah Dnewaor, a 28-year old Egyptian filmmaker, poses for a photograph in his home, during the fifth anniversary of the 2011 uprising, in Cairo, Egypt, Monday, Jan. 25, 2016. "The Jan. 25 revolution was purer than what followed. Every year we regret the outcome. This is not what we wanted. We dreamed of a better Egypt but we were also very naive and did not understand fully what was going on. Egypt is home to the people in power and we are the guests. I want to leave the country because I do not see a bright future for my daughter," says Dnewaor. Text from the AP news story, Amid heavy security, Egypt marks 5th anniversary of uprising, by Hamza Hendawi and Maggie Michael. Spotlight is the blog of AP Images, the world’s largest collection of historical and contemporary photos. AP Images provides instant access to AP’s iconic photos and adds new content every minute of every day from every corner of the world, making it an essential source of photos and graphics for professional image buyers and commercial customers. Whether your needs are for editorial, commercial, or personal use, AP Images has the content and the expert sales team to fulfill your image requirements. Visit apimages.com to learn more.